If you are planning on painting or decorating a room in your property, there are various preparations you can make to your space as well as handy tips within the decorating process to ensure that all work is easy to carry out and has a flawless end result. When painting any space, it is important to remember that you need to adjust your painting technique and tools depending on which area you are painting. 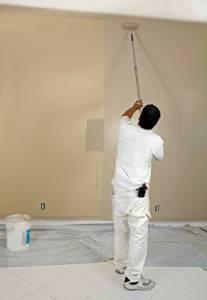 Use rollers or large brushes, doing one full coat at a time and allowing this to dry fully before attempting the next. For extra height, use a step ladder to reach those top corners. Any gaps or cracks in the walls may benefit from a small amount of plastering to create the smooth effect that is desirable for a good aesthetic quality in your room. Painting the skirting boards, though a tiresome task, is an important job in order to create a tidy aesthetic and not let down the uniformity of your neatly-painted or papered walls. Make sure you’ve covered the ground nearby with dust sheets or other covers to avoid paint going on your floor. As well as this, place some tape on the edge of the skirting board where it meets the floor and wall and simply peel away after painting to create a neat line and avoid the paintbrush flecking unwanted paint onto your wall or floor. 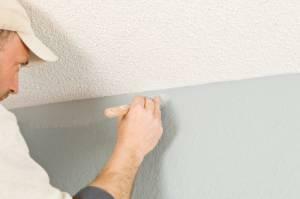 Painting ceilings should be approached in the same way as walls, with the edges being painted as skirting boards are, using tape around the edges to stop the ceiling paint from spilling or flecking onto the walls. If you have a large amount of wall space that needs filling, you could consider using a vinyl sticker to add a nice design to the space, creating an attractive visual focal point within your room.